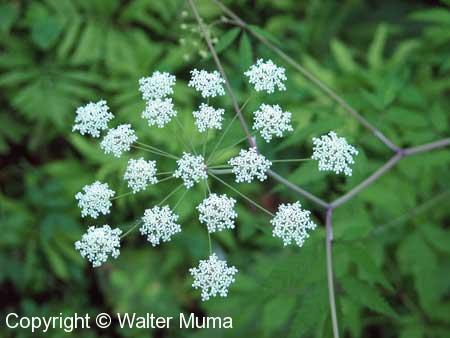 The Water Hemlocks are the most poisonous plants in North America. All parts are deadly poisonous. Even a small mouthful can kill an adult. Therefore it stands to reason that ingesting even a little bit of the juice will make a person seriously ill. It is best to learn to identify these plant by sight, rather than characteristics that require you to handle it or examine the roots or inside of the stem. It is so virulently poisonous that it is best to avoid handling it at all. Most poisonings have occurred due to confusion with edible look-alikes. Please do not rely solely on this web page for identifying these plants. Consult field guides for more detailed information. Do not handle these plants. If you do, thoroughly clean your hands immediately afterwards. Take appropriate steps to avoid accidentally ingesting any part of these plants or their juice. It is particularly important for wilderness survival enthusiasts to learn this plant, as its stems are hollow and are therefore appear to be ideally suited for use as straws or other useful itmes. Don't make use of this plant in this way - many poisonings have occurred in this manner.